Are you a small business working from home needing a professional postal address? Do you need clients to send you information but are worried about giving out personal information on where you live? Not sure that a P.O. Box number gives quite the right impression to your clients? Timesavers is pleased to offer a postal address rental and a mail forwarding service. 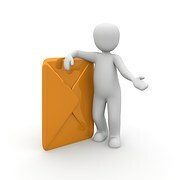 Let us be your permanent base for your important mail and forward to you as and when required. Rent a mail box with a business address in Suckley, Worcestershire for just £30 a month and use this for all your business mail. One-off registration fee of £5. Simply call us or email during office hours to check whether there’s post waiting for you. Alternatively ask us to let you know when something arrives for you. The forwarding of mail once a fortnight is included in your £30 monthly fee. If you would like your mail more frequently then simply pay each additional time you wish to have your mail forwarded to you. Cost of special delivery & recorded delivery of forwarding mail is available on request. You are of course welcome to collect you mail in person, Monday to Friday between 10am and 4pm by prior arrangement with Adrian or Siân.